Final Fantasy Type-0 can be more than a little overwhelming. Between the barrage of proper nouns and 14—fourteen!—playable characters, it'll probably take you some time to get adjusted to the pace of Square's newest role-playing game. Every time you finish a mission in Type-0, you'll find yourself back at your home base academy with a giant, imposing time-stamp on the bottom right corner of the screen. Don't worry too much about it. Though that timer can be intimidating, it actually only ticks down when you A) talk to people with exclamation points over their heads and B) step outside of town and then come back. The timer won't move at all when you're exploring the map or wandering around. Although you won't be able to do everything there is to do on a single playthrough, you do have plenty of leeway to explore, fight, and take your time between each main story mission. As you wander around the world, you'll notice that some people have exclamation points over their heads. Talking to these people will both get you items and knock the mission timer down a couple of hours, which may or may not be worth it, depending how interesting those people are and what they wind up giving you. One thing to look out for: when the people with exclamation points are your party members, talking to them will often lead to cut-scenes or other interesting side-bits that make for way better conversation than your average NPC. So prioritize talking to Class Zero classmates over everyone else. Don't bother casting walls or trying to block enemy attacks; the best way to survive in Final Fantasy Type-0 is just to get the hell out of the way. Watch baddies' movement patterns and try to anticipate when they're going to strike, then roll to the side or behind them so they can't hit you. Usually, enemies will be most vulnerable right after they attack, so it's good to get in a rhythm of dodging and then immediately striking. Attack an enemy when that circle's up and you'll either do heavy damage (if it's yellow) or instantly kill them (if it's red). This is by far the best way to take down enemies without dying and finish missions as quickly as possible, which gets you better rewards. Every enemy has a different attack pattern and different vulnerability timing, so you'll have to figure the rhythms out as you go, but one key tip here: If you just mash the attack button, you'll prevent your opponent from ever triggering that vulnerability. Patience can be really useful in this game. Try to make sure you've got both a healer and a ranged attacker in your party at all times. You may be tempted to just whip out your three best characters for every mission, but actually, you're better off keeping track of the Class Zero members you most like playing with, then picking just one of those and keeping the rest in reserve. If you like playing as Ace, Jack, and Queen, for example, you might want to play as Ace with two other party members, so if Ace dies, you can roll back in with Jack or Queen. If you started off with those three, on the other hand, they could all die at once and leave you stuck with inferior options. One of the most entertaining and lucrative sidequests is also the simplest one: between every mission, go talk to the moogle in Class Zero and take every class he has to offer. The rewards are great. You can screw yourself over in Final Fantasy Type-0, losing too many party members just before you're due to take on a big boss, and although you can always abort a mission and try again, it's also a good strategy to keep multiple save files, and save as often as possible. Yes, this is a lot to ask—you have 14 damn characters. But it's worth taking a few minutes to go through them all, upgrade as many abilities as possible, and give them all decent equipment. You never know when you might go through your whole party on a single mission. Before every mission, your moogle buddy will ask if you want to accept help from other cadets—this is generally not a good idea. Those cadets will randomly replace your party members, preventing your troops from gaining experience and leveling up. Though you'll get rewards for doing this, it may also weaken your party considerably. It's possible to play through all of Type-0 without realizing that you can find and drive your very own airship. Do not make this mistake. When you get to chapter 7, go to the front of the academy and find the quest-giver who offers a mission called Operation Homecoming. It's really easy. Once you've finished that mission and you're in the city of Bazz, go find the person who wants you to kill an Iron Giant in the Silent Keys. When you get to the Silent Keys, kill all the giants and turn on all the engines. You'll need it before you move the camera around. 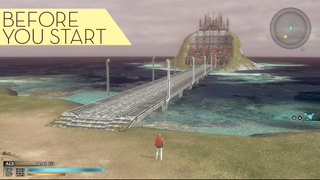 When you finish Final Fantasy Type-0, you can start a new game with your old save file, carrying over all your characters' levels so you can start from the beginning on a higher difficulty setting. This game is built to be played twice. In fact, there are some essential albeit optional plot scenes you'll only see if you play through the game a second time. This is annoying, yes, but hey, at least you don't have to worry if you miss a sidequest or two.